NYC, 04/29/2019, 2:00PM. Lizzie (2018): Accused Of Murdering Parents. 105 min. Director: Craig William Macneill. Starring Chloë Sevigny, Kristen Stewart, Jeff Perry. 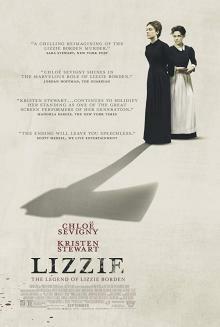 It is based on the true story of Lizzie Borden, who was accused and acquitted of the axe murders of her father and stepmother in Fall River, Massachusetts, in 1892.